City Hall Reading – photos available on Facebook. Open Heart Farming 2017 was launched June 14 at Halifax Central Library. Thanks to all who came out. Photos are available on our Facebook page: https://www.facebook.com/media/set/?set=a.10155622020213394.1073741834.286345318393&type=1&l=b6fe2fad6d You do not need be a Facebook user to view the photos. Thanks to all who came out for our City Hall launch for the April issue. Photos are available on our Facebook page: https://www.facebook.com/media/set/?set=a.10155434445428394.1073741833.286345318393&type=1&l=f505c903d7 You do not need be a Facebook user to view the photos. Photos from the launch available on our Facebook page. 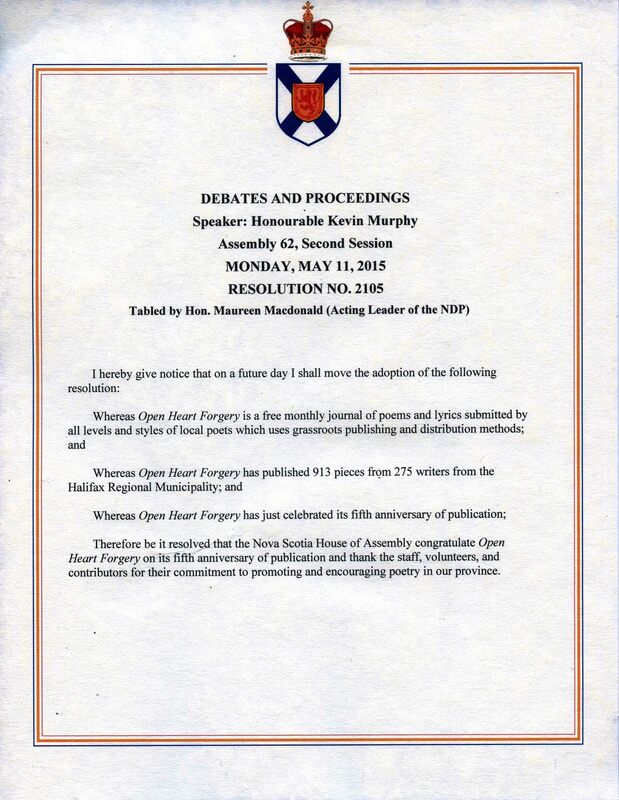 The launch of the April issue of Open Heart Forgery took place at Halifax City Hall on Monday, April 11th. Pictures available on Facebook. Open Heart Farming: Twilight Meetings, launched in June at the Halifax Central Library. A wonderful field of poets, an audience of about 50, and a good, old-fashioned conclusion: Mingling with food and new and old friends. Thanks to all the poets – 9 of the 18 poets were there, including Adam Bateman, the star of his mom’s poem ‘Adam’s Peas and Carrots.’ Adam read his haiku ‘The Red Barn.’ Also reading was Ginny Wang, a Chinese high school student here in Halifax for a semester. See pictures on Facebook. Maureen Macdonald tables a resolution in the provincial legislature to congratulate OHF on five years of publication. 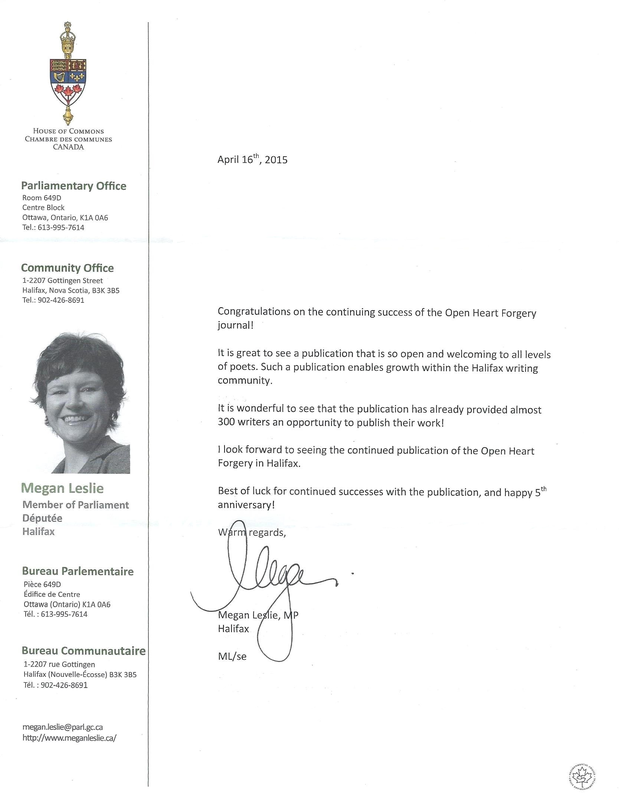 MP Megan Leslie congratulates OHF on five years of publication. April 2015 April 2015 issue launch at City Hall. Pictures on Facebook. January 2015 Read an article about Open Heart Forgery in East Coast Post. February 2014 Mayor Savage Congratulates OHF for publishing 200 local writers. Read the letter. March 2010 ohForgery #1 launched at Local Jo Café! Thanks to all who celebrated the birth of Halifax’s guerilla literary journal.